Thanks for the amazing quote Junon. Very inspiring and wise words indeed. Vijay, I hope you don't think I was being harsh to you. Your loyalty for yoshimitsu, despite your apprehensions, is worthy of admiration. It is true, without a doubt, even from this noob, that Yoshi requires a lot of skill to master, but you need to think beyond 'win/lose' and know that you can lose, and still be the better player. I've watched countless Yoshi battles in which Yoshi loses, and yet still been in awe of the poetry and art in the player's style. This, in my opinion, is the real value of Yoshi; the reminder that in life, it is often the journy, and not the destination, that matters. He wants us to know this, because it's a lesson we can take beyond the game itself. I recently quit the game, because I too had the wrong attitude, but Yoshi repayed my own past loyalty by not giving up on ME. And now, I am back in the game and trying my best. Thanks Junon... That is indeed one of the best quotes for Tekken.... I will treasure it... And thanks every one for being so nice even though i act rude most of the time... I am so addicted to Tekken 5 Yoshi that i still try to low crush moves and end up missing the crushes... @ thanks a lot tenshi... for the advice.... I think Yoshi still doest have... Decent high crush which used to be his d/b 1... Really you cant play Tekken without special mid moves... And i cant attend any tourney..for people here do not have respect or admiration or anything for games... Its like a disgrace... And i am reaching 30...over here people over 25 hardly play any game.... So... Its very hard ... On the other hand people have high expectations on me... Being doctor and eldest of family... Worst thing is there are no tourneys over here... All i learn is from internet ... Oh its nice to hear Jembru is back on Tekken... Finally thanks guys for everything ! And just try to google out "tekken india"
Hey, I would love to be added. This seems like a great community, and I know that I am a bit new but I am very active for my time here. ._. At the risk of necroposting potentially? I'd like to apply for the membership-bump. 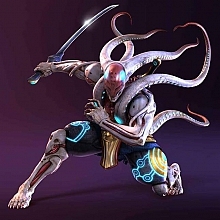 I'm a die hard fan of Yoshimitsu; I'm not exactly the creative type or artistic, but I do love to play the game, the storyline of it all, and a bit of reflection on both. I cannot be the most active member, but I do come on here several times a week, if only lurking. Haha, thank you! Hopefully once I get better I'll have quite the contributions to make.